The iConverter 2GXM2 conforms to the Ethernet in the First Mile (EFM) fiber standards to support Fiber-to-the-X Metropolitan and Enterprise LAN networks. The 2GXM2 provides intelligent, securely managed service demarcation at the customer premises, offering Quality of Service and enhanced Bandwidth Control (ratelimiting) capabilities. 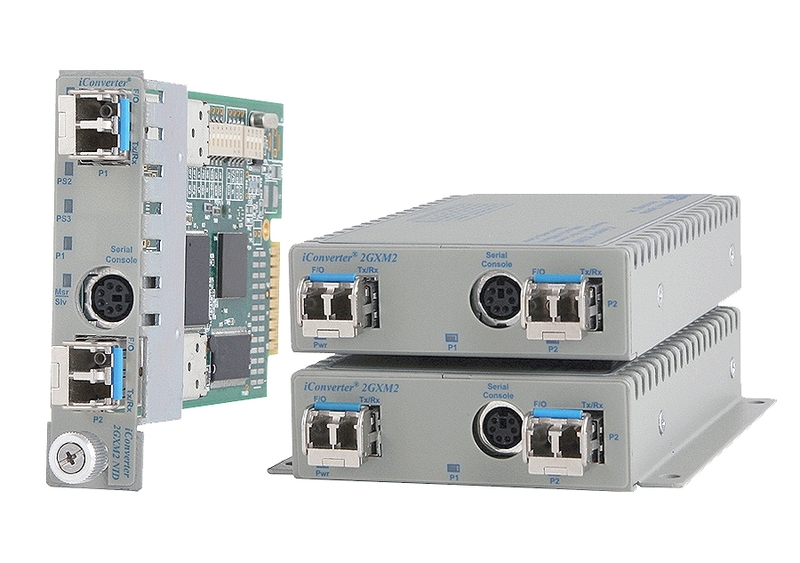 The iConverter 2GXM2 is a carrier-grade Network Interface Device (NID) that provides Gigabit Ethernet fiber to fiber media conversion with integrated management. For Service Providers, the 2GXM2 NID provides MEF 9, 14 and 21 certified demarcation of Carrier Ethernet E-Line services. The 2GXM2 is a cost-effective demarcation device for Service Providers to deliver best-effort Ethernet services. For Enterprise and Government and Utility networks, the 2GXM2 enables secure demarcation and management for mission-critical applications delivered over fiber infrastructure. The 2GXM2 supports the IEEE 802.3ah Link OAM standard with Fault Detection, Performance Monitoring and Remote Loopback for Ethernet in the First Mile (EFM) access links. The 2GXM2 detects and indicates link faults, dying gasp and other critical events. Dying gasp is supported on all standalone models and plug-in models when installed in a 1-Module or 2-Module chassis with dying gasp support. The 2GXM2 also supports Unidirectional Link Fault Detection that indicates faults in either direction of the fiber link. 802.3ah Performance Monitoring tools are used for the detection and notification of link performance (quality) faults. Ethernet data performance can deteriorate slowly over time, and the 2GXM2 allows the setting of error-per-second thresholds with event notification for early indication of issues that may be resolved prior to loss of service. Remote Loopback is used for fault localization and link performance testing. When a 2GXM2 port is in loopback mode, all received link traffic is looped back and transmitted back unaltered. The statistics from the 2GXM2 port and the remote link partner can be compared for consistency. The iConverter 2GXM2 supports the IEEE 802.1Q tag Virtual Local Area Network (VLAN) packet tagging and untagging (including Q-in-Q tunneling and 802.1ad service provider tag) and the 802.1p Quality of Service priority standards. VLAN 802.1ad tunneling technology enables service providers to offer their customers E-Line services via Ethernet Virtual Circuits (EVC). The 802.1p Quality of Service (QoS) prioritization standard enables delivery of high-priority, real-time applications such as voice and video over Ethernet. The enhanced Bandwidth Control feature controls bandwidth between the fiber ports in 64Kbps increments from 64K to Full Line Speed. The 2GXM2 features Port Access Control which blocks user service while maintaining the network link. Port Access Control enables the service provider to control user access while maintaining port configuration for easy disabling or enabling of customer service. Port Access Control provides enterprise administrators the capability to improve network security by controlling port access when the port is not in use. The 2GXM2 supports reporting of utilization, port and optical performance statistics. Port statistics are available for 38 different parameters for each fiber ports. Additionally, full optical performance statistics are available on SFP fiber transceivers with a digital diagnostic interface. The 2GXM2 Small Form Pluggable (SFP) model supports a wide variety of SFP transceivers for FTTX and CWDM applications. SFP fiber transceivers are available with multimode (MM) dual fiber, single-mode (SM) dual fiber and single-mode single-fiber (SF) options. The 2GXM2 features multiple, user-selectable link fault detection modes, including Link Fault Propagation, Remote Fault Detection and Asymmetrical Fault Detection. These Link Modes provide rapid fault detection and isolation by monitoring the state of the cabling hardware, and operate independently of the network management. The 2GXM2 is available as a compact standalone unit or as a chassis plug-in module. The hot-swappable 2GXM2 plugin module can be mounted in a 19 or 5-Module chassis with redundant AC and DC power supplies. It can also be mounted in a 2-Module AC or DC powered chassis, or in a 1-Module chassis with AC or DC power input. The standalone 2GXM2 is available as a tabletop or wall-mount unit. The tabletop model can be DIN-rail mounted using an optional DIN-rail mounting kit. Both the tabletop and the wall-mount models are DC powered and are available with an external AC to DC power adapter or a terminal connector for DC power. The 2GXM2 standalone unit combines management capability with a compact chassis for deployment at the demarcation point. 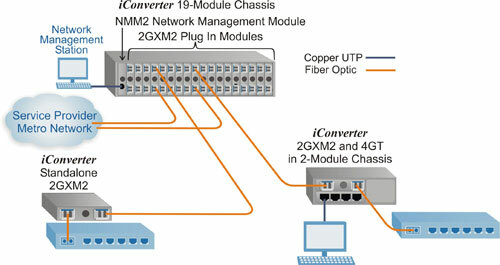 An iConverter 2GXM2 is installed in a 19-Module Chassis with an iConverter Network Management Module (NMM2) at the Central Office or Network Core. The 2GXM2 has an integrated management processor that isolates the encrypted management data from the customer data and communicates with the NMM2 via a separate management backplane bus. Management traffic on the user data lines is IP-less and carried on a securely encrypted data channel to protect the management from unauthorized access. The 19-Module chassis requires only a single IP address to manage itself and up to eighteen remote GX/TM2 or 2GXM2 NIDs managed by the OAM channel. This is the ideal configuration for networks that separate secure management traffic from the service (customer) traffic on different networks, or when management IP addresses are at a premium. 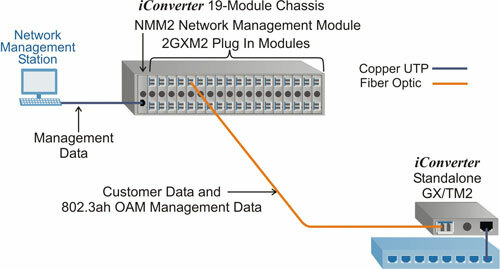 At the Central Office, the 2GXM2 plug-in module is installed in a managed iConverter 19-Module chassis for high-density fiber distribution. At Customer Premises on the right, a 2GXM2 plug-in module and an iConverter 4GT four-port switch module are installed in a 2-Module chassis, and share data via the Ethernet Backplane. This configuration functions as a remotely managed demarcation switch with two fiber uplink ports and four copper ports that drop off Ethernet services. At Customer Premises on the left, the 2GXM2 standalone NID provides two fiber uplink ports for intelligent demarcation of Ethernet services. The 2GXM2 has integrated management, eliminating the cost and space required for external management hardware. The iConverter management system provides comprehensive remote configuration and performance monitoring. iConverter management is available via IP-Less protocol using the 802.3ah OAM channel or Omnitron’s Secure OAM channel, or using SNMP or Telnet. Management is accessed via Omnitron’s NetOutlook® SNMP Network Management Software with an intuitive Graphical User Interface, or third party SNMP software. Telnet and CLI management interfaces are also supported, and utilize an easy-to-use, menu-driven interface. The CLI interface is accessed via a Serial Console Port, that provides local configuration and allows for firmware updates. Additionally, the port can be connected to a serial modem to provide an alternative remote management path. The 2GXM2 can be managed through IP protocols, SNMPv1, SNMPv2c, SNMPv3 and Telnet. The IP address of the 2GXM2 can be user-defined or resolved through the DHCP host on the network. The IP protocols for management access can be enabled or disabled individually or as a group. Access to the management is protected by password authentication. SMNPv3 strengthens secure access to devices by a combination of authenticating and encrypting packets over the network. Management VLAN can also be defined to separate management traffic from customer traffic.